The North Butress Couloir route on Colchuck Peak sees a massive avalanche. Join us in exploring the lessons learned from this close call. With the recent stint of sun and warm spring conditions has come the annual cycle of wet avalanches in the Cascades. Mountaineers Sherrie Trecker and Nicole Cederblom were on a private climb and shared this close call with us. 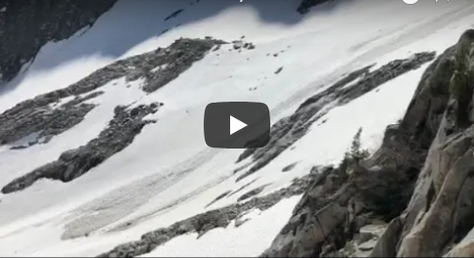 The two were roping up to begin an attempt on the North Buttress Couloir route on Colchuck Peak on May 24, 2018, when the lower half of their descent route was consumed in a massive wet avalanche. The video is eye opening, and that led to Sherrie and Nicole's decision to abort this climb. The two wanted to share some lessons learned from their experience and to remind everyone of the importance of safety in avalanche terrain this time of year. The video shows how the wet snow avalanche, which lasted for more than 10 minutes, carried boulders and human-sized blocks of ice and took out a ton of terrain. It was so loud we initially thought we were being buzzed by an off-route airplane. In the outdoor community, there's can be a perception that wet snow avalanches aren't so dangerous, but that's clearly not the case. Wet avalanches carry a lot of energy, can carry victims into harms way, and large ones like this can engulf a party leading to trauma and burial. Terrain traps can include subduction into buried streams, as Steve Smith recounted in a recent blog about his experience on Aasgard pass. This avalanche occurred on a slope that had already seen visible recent avalanche activity. Many unwary are inclined to climb on a slope that has 'just avalanched' because they believe it's safe. However, just because a cornice took out one weak layer, doesn't mean that hot, wet conditions won't destabilize the consolidated debris and/or have enough energy to affect a lower weak layer. Uncertainty factors: when assessing risk it's important to factor in the things you can't see and realize that they will increase hazard. Many climbs, including the Colchuck NBC, have portions of the route that exist on different slope angles and aspects. The snow you can evaluate at the bottom may be nothing like what you'll experience at the top of the route. That introduces uncertainty factors and increases your risk. This is particularly true on more committing routes because you won't have the option to safely bail. Looking back on our descent and realizing the part we couldn't see from the base looked eerily similar to the avalanche trigger zone (similar slope aspect, and tons of sun exposure), we feel we made a wise decision to save this route for another day. The second lesson is very important and although I know the possibility of the second slide is real, it is interesting that I haven't given it much thought when performing beacon search. It intrigues me to get more knowledge on this subject to efficiently judge if the scene is safe (in this regard among others) for a rescue before diving in as every minute matters. Please ad a note Re: the party of one you mentioned. Although NWAC daily data only goes back ten days, Accuweather shows that Seattle was 75 degrees on May 22nd, 81 degrees on May 23rd, and 70 degrees on May 24th (normals are about 66) which should have meant that Seattle had onshore flow on May 24th. But it is most probable that the freezing level had not yet fallen east of the Cascades on May 24th. Winter conditions aside, the rule of watching the weather and following weather data is still crucial for exposed snow climbs in spring weather. A couloir climb like that one should be done in relatively cool conditions with the likelihood of a good freeze. It should also be ascended before the sun has a chance to warm the rocks and adjacent snow, which makes a NE exposure problematic. Even then, at that time of year cornices and snow slabs on warm rock may yet fail.